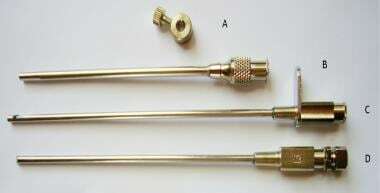 Cope needles and Abrams needles, as shown in the images below, are most commonly used for blind or closed needle biopsy. This procedure is generally performed in the setting of a large pleural effusion without any imaging other than chest radiography. The patient is positioned and the biopsy site is selected after careful physical examination and review of imaging. Under aseptic measures, lidocaine is injected locally to anesthetize the selected site. A small skin nick is made with a scalpel blade. The Cope needle with stylet is introduced through the skin incision at the upper surface of the rib in order to prevent neurovascular bundle damage. The needle is advanced until pleural fluid is obtained. The stylet is then removed and the biopsy trocar introduced. A 50-mL syringe is attached with a biopsy needle, which provides a closed system through which pleural fluid may be withdrawn, confirming the location of the biopsy needle in the pleural space. The biopsy needle is turned, with the right-angled projection facing downward. Both the outer cannula and the biopsy trocar are partially withdrawn until the parietal pleura is engaged. Gentle traction is applied to the biopsy trocar with one hand, and the outer cannula is advanced with a rotary motion. This action allows dissection of pleural tissue and intercostal muscle. 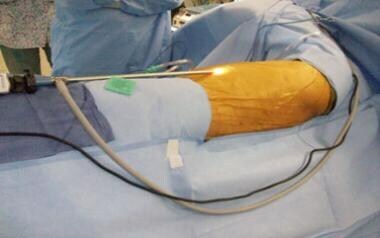 The biopsy needle is removed, during which the patient is instructed to make an “EEEEE” sound to minimize the risk of air entry. The biopsy specimen is collected with the attached syringe applying positive pressure. The needle site is observed for bleeding complications, and a pressure dressing is applied to prevent subcutaneous accumulation of pleural fluid. The Abrams pleural biopsy needle consists of 3 parts, with 2 concentric tubes and a stylet. The outer tube has a trocar point and a deep notch behind the trocar point that can be closed with inner tube rotary movement, allowing cutting of the pleural tissue. The general technique for pleural biopsy with the Abrams needle is similar to that described for the Cope needle. Blind pleural biopsy is also performed using a Tru-cut needle in the setting of moderate to large pleural effusions, with results that are comparable with those obtained with Abrams and Cope pleural biopsy needles. [5, 6] However, the Tru-cut needle is generally used with image guidance via ultrasonography or CT scanning. Hemorrhagic states are considered a relative contraindication to pleural biopsy. The coagulation profile should be corrected prior to any biopsy procedure to minimize the risk of bleeding, including chest wall hematoma and hemothorax. In a recent study by Pandit et al using the Abrams needle, pleural biopsy tissue yielded the diagnosis of tuberculosis and malignancy in 90.9% and 63.2% of cases, respectively, and tubercular granuloma were present histopathologically in all cases of tuberculosis. The analysis of the pleural fluid for acid-fast bacilli stain was negative in all cases of confirmed tuberculous effusion, with a pleural tissue acid fast stain positive in only 22% of cases. Granulomatous pleuritis is not specific for tuberculosis; it is also found in other disease processes, including fungal infections, sarcoidosis, and rheumatoid disease. Multiple studies have compared the diagnostic sensitivity of the Cope needle with that of the Abrams needle. In a 2006 study of 57 patients with pleural tuberculosis, the diagnostic yield for the Cope needle was 85% compared to 57% for the Abrams needle. However, this finding did not reach statistical significance. The incidence of pneumothorax was higher with the Cope needle than with the Abrams needle. In addition, the Cope needle requires more patient cooperation to exhale maximally in order to create less negative intrapleural pressure and thus minimize the risk of pneumothorax. Given the inability to target the abnormal thickened pleura and the frequent complications (eg, pneumothorax) associated with a closed pleural biopsy,  this procedure is restricted to patients with a large pleural effusion and has largely been replaced with image-guided pleural biopsy. The procedural yield of pleural biopsy using ultrasonography or CT guidance is increased owing to the ability to precisely target an abnormal area of the pleura. [13, 14, 15] Ultrasonography is more sensitive in detecting loculated pleural effusions. It also has the advantage of providing a real-time approach to the biopsy without radiation. CT guidance allows better visualization of the extent of focal pleural masses, in addition to a clearer delineation of parenchymal pathology. An area of pleural abnormality is identified using ultrasonography or CT imaging. The patient is then positioned according to the pleural lesions to be biopsied—prone for paravertebral lesions and supine for lateral or anterior lesions. Automated cutting needle devices, as shown in the images below, provide better histological samples than fine-needle aspiration. Three or more samples are generally obtained to ensure adequate pleural tissue for histopathological diagnosis. Tru-cut needle before activation, placed proximal to the lesion under imaging guidance. Tru-cut needle (activated) showing the site for the collection of biopsy tissue. Utilizing a sterile technique, a local anesthetic agent is administered. The large coaxial needle with stylet is then advanced under ultrasound or CT guidance into the pleural lesion, as depicted in the images below. 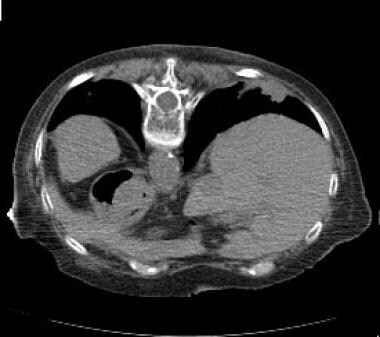 Thoracic CT performed in the prone position demonstrates a right-sided irregular pleural-based lesion. 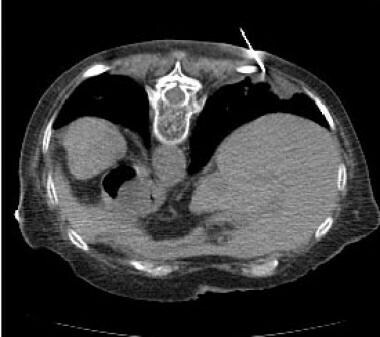 CT-guided pleural biopsy and Tru-cut needle. The stylet is then removed manually, and the cutting needle device is placed with a tip proximal to the biopsy site to allow the “throw” of device. The tissue is obtained with the activation of the biopsy device (see image below). Multiple pleural biopsies can be collected while keeping the coaxial outer needle in place. Tru-cut needle with pleural tissue sample obtained following CT-guided pleural biopsy. Image-guided pleural biopsy is safe and allows for the ability to biopsy abnormal pleural tissue. The cutting biopsy needle appears to be more sensitive for malignancy than fine-needle aspiration, with a sensitivity of 91% in the diagnosis of mesothelioma. The complication rates are lower for image-guided biopsy than for blind pleural biopsy, particularly in relation to pneumothorax. Patients who are unable to hold their breath during the biopsy, either because of underlying lung pathology or positive pressure ventilation, are more likely to develop the complications of pneumothorax and lung injury. The advancement of endoscopic instrumentation has allowed for the ability to directly visualize the pleural space in a less-invasive fashion. This minimally invasive procedure is known as pleuroscopy and is performed by a pulmonologist in the endoscopy suite or in the operating room under conscious sedation with local anesthesia. The endoscope is introduced into the pleural cavity by making a window between the ribs. This allows direct visualization of pleural pathology, biopsies, and chest tube placement with pleurodesis for recurrent pleural effusions. The semirigid pleuroscope used for the procedure is similar to a bronchoscope in design and handling. The difference is that the pleuroscope shaft has two sections—the larger proximal rigid portion and flexible distal end, which moves with the handle. The pleuroscope has a working channel to accommodate the biopsy forceps and other instruments. A disposable plastic trocar allows passage of the scope through the chest wall. Pleuroscopy is performed with a semirigid bronchoscope that functions similarly to a flexible bronchoscope. Continuous cardiopulmonary monitoring with electrocardiography and pulse oximetry is conducted. An intravenous narcotic (fentanyl) and benzodiazepine (midazolam) are used for conscious sedation. Alternatively, general anesthesia with intubation can also be considered. The patient is placed in the lateral decubitus position, with the affected side facing upward. The procedure can be initiated through an intercostal incision, or a pneumothorax can be introduced prior to the procedure, with drainage of the pleural fluid. The pneumothorax allows the lung to collapse and move away from the chest wall to facilitate trocar insertion. The site of trocar insertion depends on the suspected pathology. If malignancy is suspected, the trocar is advanced over the sixth intercostal space at the midaxillary line. Otherwise, the fourth space is preferred, given the better visualization of the lung apex from this position. For diagnostic purposes, a single-puncture technique is used that involves a 1- to 2-cm incision in the midaxillary line between the fourth and seventh intercostal spaces of the chest wall. Multiple parietal pleural biopsies can be obtained through the single port of entry with the flexible biopsy forceps. A double-puncture technique is preferred for adhesiolysis, lung biopsy, and complex loculated fluid drainage. A small-bore catheter or chest tube is placed at the conclusion of the procedure and can be removed after the lungs are fully inflated. The flexible-rigid pleuroscope is considered to be a safe procedure, with no morbidity or mortality observed in a study of 51 patients. The major concern of the procedure is pleural hemorrhage from underlying intercostal blood vessels. Immediate pressure using forceps and a small piece of gauze can be applied to control bleeding. If bleeding is significant, an additional incision should be considered to access the pleural cavity in order to perform tissue cauterization. If bleeding is not controlled with direct pressure and cauterization, ligation of the bleeding vessels with endoclips should be considered. Ongoing bleeding may require thoracotomy. Video-assisted thoracic surgery (VATS) allows additional access to lung tissue and operative interventions, including lung biopsies, lobectomy, pericardial window placement, and empyema drainage. VATS is carried out by surgeons in an operating room under general anesthesia using single-lung ventilation with double-lumen endotracheal intubation. Rigid telescopes with different vision angles for direct and oblique viewing. Rigid telescope attached with light source and endoscopic camera. The different telescopes have various angles, from 0° for direct visualization to oblique (30° or 50°) and periscopic (90°) viewing. 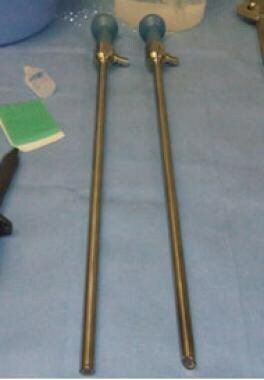 Various sizes of trocars are deployed as a means of introduction for the rigid telescope through the chest wall. Insertion of the rigid telescope with trocars placement in chest wall. VATS is performed after placing a double-lumen endotracheal tube or a single-lumen tube with a bronchial blocker. The patient is usually placed in the lateral decubitus position with the affected area exposed. However, the procedure can also be performed in the supine position. Using sterile techniques, 1-3 incisions, each 0.5-1 cm, are placed. The initial port site is created by incising the skin with the scalpel, then using a hemostat to bluntly spread the fascia and muscle layers until the pleural cavity is entered. The first incision placement should be at the maximum distance from the site of dissection or inspection to allow better visualization. Surgical interventions are made over the rib to prevent any injury to the neurovascular bundle. 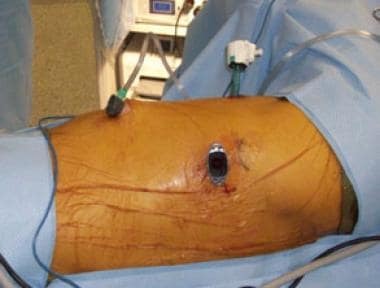 One of the incisions is usually located at a site suitable for the placement of the chest tube at the conclusion of the procedure. The second incision is placed more cephalad in a more anterior or posterior position depending on area of interest to be biopsied. A port is placed through the first incision and a camera is inserted. The second incision is created with direct visualization of the camera from the inside. The pleural space is then inspected and areas of interest are biopsied at multiple sites after a thorough inspection is completed. Biopsy samples can be collected with biopsy forceps or other endoscopic instruments. After completion of the biopsy, the camera is rotated between port sites to check for hemostasis. A chest tube is then placed. The lung is then reinflated, and the remaining port site is closed with absorbable sutures. Video-assisted thoracic surgery (VATS) pleural biopsy. Chest tubes are removed when air leaks have resolved and drainage is at acceptable levels. Chest X- Ray is performed post procedure and after removal of the chest tube to assess for pneumothoax. Several factors can limit this diagnostic intervention, including marked coagulopathy, an inability to obtain unilateral lung ventilation, or inability of the patient to tolerate the procedure because of hypoxemia. Adhesions represent a relative contraindication depending on their location and density. In patients with pleural lesions or pleural thickening, image-guided pleural biopsy should be the primary method of investigation. Thoracoscopy would be of clinical benefit in nontuberculous benign pleural effusions without pleural thickening. Salyer WR, Eggleston JC, Erozan YS. Efficacy of pleural needle biopsy and pleural fluid cytopathology in the diagnosis of malignant neoplasm involving the pleura. Chest. 1975 May. 67(5):536-9. [Medline]. Frank W. [Current diagnostic approach to pleural effusion]. Pneumologie. 2004 Nov. 58(11):777-90. [Medline]. Prakash UB, Reiman HM. Comparison of needle biopsy with cytologic analysis for the evaluation of pleural effusion: analysis of 414 cases. Mayo Clin Proc. 1985 Mar. 60(3):158-64. [Medline]. Koss MN, Fleming M, Przygodzki RM, Sherrod A, Travis W, Hochholzer L. Adenocarcinoma simulating mesothelioma: a clinicopathologic and immunohistochemical study of 29 cases. Ann Diagn Pathol. 1998 Apr. 2(2):93-102. [Medline]. Christopher DJ, Peter JV, Cherian AM. Blind pleural biopsy using a Tru-cut needle in moderate to large pleural effusion--an experience. Singapore Med J. 1998 May. 39(5):196-9. [Medline]. James P, Gupta R, Christopher DJ, Balamugesh T. Evaluation of the diagnostic yield and safety of closed pleural biopsy in the diagnosis of pleural effusion. Indian J Tuberc. 2010 Jan. 57(1):19-24. [Medline]. Gouda AM, Al-Shareef NS. A comparison between Cope and Abrams needle in the diagnosis of the pleural effusion. Annals of Thoracic Medicine. 2006. 1(1):12-5. Biswas B, Sharma SK, Negi RS, Gupta N, Jaswal VM, Niranjan N. Pleural effusion: Role of pleural fluid cytology, adenosine deaminase level, and pleural biopsy in diagnosis. J Cytol. 2016 Jul-Sep. 33 (3):159-162. [Medline]. [Full Text]. Scerbo J, Keltz H, Stone DJ. A prospective study of closed pleural biopsies. JAMA. 1971 Oct 18. 218(3):377-80. [Medline]. Pandit S, Chaudhuri AD, Datta SB, Dey A, Bhanja P. Role of pleural biopsy in etiological diagnosis of pleural effusion. Lung India. 2010 Oct. 27(4):202-4. [Medline]. [Full Text]. Morrone N, Algranti E, Barreto E. Pleural biopsy with Cope and Abrams needles. Chest. 1987 Dec. 92(6):1050-2. [Medline]. Emad A, Rezaian GR. Closed percutaneous pleural brushing: a new method for diagnosis of malignant pleural effusions. Respir Med. 1998 Apr. 92(4):659-63. [Medline]. Sconfienza LM, Mauri G, Grossi F, et al. Pleural and peripheral lung lesions: comparison of US- and CT-guided biopsy. Radiology. 2013 Mar. 266(3):930-5. [Medline]. Metintas M, Yildirim H, Kaya T, Ak G, Dundar E, Ozkan R, et al. CT Scan-Guided Abrams' Needle Pleural Biopsy versus Ultrasound-Assisted Cutting Needle Pleural Biopsy for Diagnosis in Patients with Pleural Effusion: A Randomized, Controlled Trial. Respiration. 2016. 91 (2):156-63. [Medline]. [Full Text]. Bibby AC, Maskell NA. Pleural biopsies in undiagnosed pleural effusions; Abrams vs image-guided vs thoracoscopic biopsies. Curr Opin Pulm Med. 2016 Jul. 22 (4):392-8. [Medline]. Adams RF, Gleeson FV. Percutaneous image-guided cutting-needle biopsy of the pleura in the presence of a suspected malignant effusion. Radiology. 2001 May. 219(2):510-4. [Medline]. Lee P, Colt HG. State of the art: pleuroscopy. J Thorac Oncol. 2007 Jul. 2(7):663-70. [Medline]. Lee P, Mathur PN, Colt HG. Advances in thoracoscopy: 100 years since Jacobaeus. Respiration. 2010. 79(3):177-86. [Medline]. Lee P, Hsu A, Lo C, Colt HG. Prospective evaluation of flex-rigid pleuroscopy for indeterminate pleural effusion: accuracy, safety and outcome. Respirology. 2007 Nov. 12(6):881-6. [Medline]. Harvey-Taylor J, Zhang Y, Kuderer V, Cooke DT. Diagnosis of systemic amyloidosis and amyloidosis mediated cardiomyopathy by VATS pleural biopsy for chronic pleural effusion. J Thorac Dis. 2013 Jun. 5(3):E112-4. [Medline]. [Full Text]. Agarwal PP, Seely JM, Matzinger FR, et al. Pleural mesothelioma: sensitivity and incidence of needle track seeding after image-guided biopsy versus surgical biopsy. Radiology. 2006 Nov. 241(2):589-94. [Medline]. Bydder S, Phillips M, Joseph DJ, et al. A randomised trial of single-dose radiotherapy to prevent procedure tract metastasis by malignant mesothelioma. Br J Cancer. 2004 Jul 5. 91(1):9-10. [Medline]. [Full Text]. O'Rourke N, Garcia JC, Paul J, Lawless C, McMenemin R, Hill J. A randomised controlled trial of intervention site radiotherapy in malignant pleural mesothelioma. Radiother Oncol. 2007 Jul. 84(1):18-22. [Medline]. Berger HW, Mejia E. Tuberculous pleurisy. Chest. 1973 Jan. 63(1):88-92. [Medline]. Sakuraba M, Masuda K, Hebisawa A, Sagara Y, Komatsu H. Pleural effusion adenosine deaminase (ADA) level and occult tuberculous pleurisy. Ann Thorac Cardiovasc Surg. 2009 Oct. 15(5):294-6. [Medline]. The authors wish to acknowledge the assistance and expertise of the following individuals in the preparation of the documents: Dr. Jason Hill, Dr. Peter Kvamme in the Department of Radiology, Dr. Rochi Venogopal in the Department of Surgery, and Alison Locket at the Graduate Medical School, University of Tennessee Medical Center.